In a St. Cloud courtroom, Jason McLaughlin waived his right to a trial by jury. Now a judge will hear the testimony and decide on the 16-year-old's future. 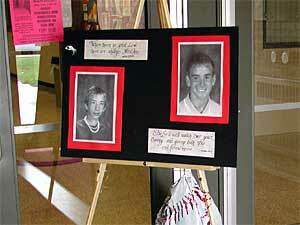 McLaughlin is charged in the shooting deaths of two schoolmates at a central Minnesota high school in the fall of 2003. St. Cloud, Minn. — The move is expected shorten the trial, but legal experts also say it could be a strategy by the defense in a complicated and emotional case. Jason McLaughlin appeared in Stearns County court dressed in a green-plaid shirt, tucked into khaki dress pants, his brown hair cut very short. McLaughlin is 16, his 17th birthday is less than a month away. His parents and sister sat just behind him in the courtroom. The families of the two boys he's accused of killing were just a few feet away. Today was supposed to mark the beginning of jury selection in McLaughlin's murder trial. But his attorney, Daniel Eller, announced that McLaughlin wanted to waive his right to a jury. Eller said the teenager understood the state had enough evidence to show that he killed Aaron Rollins, and wouldn't contest a second-degree murder charge. Aaron Rollins is thought to have been hit by a stray bullet intended for Seth Bartell. McLaughlin is charged with first-degree murder for the death of Bartell, he's pleaded not guilty by reason of mental illness to that charge. Both students died after the shooting. McLaughlin took the stand and answered questions from his lawyer, the state's prosecutor and the judge. He said he understood that he was waiving his right to a jury trial and what that meant. Attorney Daniel Eller says a trial before a judge is the best option in this case. Eller claims finding an untainted jury could have taken weeks in Stearns County and he didn't want the trial moved to another part of the state, only to start the whole process over. Eller says it's in everybody's interest to get the trial started as soon as possible. "It's time to put this case to rest and that's what we wanted to do and the easiest way is to submit it to the judge," Eller said. "We think he's going to be fair, the issues aren't that complicated in this case, and that's why we did it,"
Eller hopes the judge takes into consideration McLaughlin's mental state at the time of the shooting and sentences him to a institution for treatment instead of prison. The families of the two shooting victims left the courthouse quickly, saying only that the change in the trial doesn't have much affect on them. The prosecuting attorney says the same. William Klump is with the Minnesota Attorney General's office. "It doesn't matter one way or the other," said Klump. Klump agrees the move will shorten the trial, probably by several weeks. That's because explaining the case to a judge is easier than to a jury. "In the sense that you're dealing with a fact finder that is more familiar with the process and some of the issues that come up, where as with a jury you're starting out with essentially a blank slate," said Klump. Klump says he's confident the judge will find McLaughlin guilty on all counts. Waiving the right to a jury may shorten the trail, but it could also be a strategic move by the defense. Leonardo Castro, Chief Public Defender for Hennepin County, says the defense may think a judge is more likely to consider McLaughlin's mental state at the time of the shooting, and less likely to get swept up by emotional testimony. "If it is a more technical legal nature, perhaps it would be why they were waiving the jury and arguing it to a judge," said Castro. Castro agrees finding an impartial jury would have been tough. It could have forced the trial out of Stearns County and Castro says that's probably not what McLaughlin's attorney wanted. Daniel Eller is respected in central Minnesota, and wouldn't want the trial to leave his turf. "If the lawyer is active and well-respected and known in the community, that adds some value to you case and the persuasiveness to your case," said Castro. Jason McLaughlin's murder trial is now set to start next Tuesday morning with opening statements. Testimony is expected to begin later that day.